Amazon’s Jeff Bezos, famously mysterious about some matters, is also known for spouting some fabulous, and fabulously confusing, quotes … Can you work out which ones are his? Do you know Bezos well enough to work out which of these quotes are his and which are from another CEO? Amusingly, Jeff’s quote is the first one–and it reveals he’s not looked into the science of the matter much. Quote two is by E-ink’s CEO, Russ Wilcox. 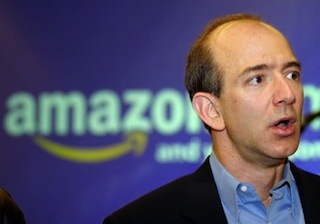 His business may be bound to Amazon’s success, but maybe he should read the iPad sales figures? No prizes here: Bezos’ is behind the second quote, made when defending the unusual choice to let negative reviews stay on Amazon.com. Google’s Eric Schmidt is responsible for the first one, and it highlights how differently both companies treat (and exploit) advertising. The first quote is Google’s Eric Schmidt again, talking about how publishing’s earning mechanisms may change in the digital future. The odd attitude to promotion in quote two is Bezos himself, who evidently intends to let the Kindle promote itself. Quote one is Bezos–speaking to the Wall Street Journal about the future of interactive books, and presumably as a slight against the kind of amazing interactive books and magazines that are slowly turning up on the iPad. To say nothing of the bright future of interactive infographics in newspapers. Quote two is Steve Jobs himself, on the future of books of all sorts, before Apple launched iBooks. Quote three? Egon from Ghostbusters. We couldn’t resist. Quote one is Steve Jobs again, banging on about his fabulous new category product. The second quote is Bezos, banging on about the army of tablet clones that’ll chase down the iPad, and calmly ignoring the army of e-reader clones that’re chasing down the Kindle.